Happy New Year! I am always so excited at the start of a new year. Everything seems somehow fresh and clean and full of possibility and promise! It causes me to reflect on how I can improve in each area of my life, whether it be in being a better wife, friend, daughter, sister, listening ear or teacher. I'm not much of a once-a-year resolution person. I tend to opt for a daily setting of hopes and dreams and goals, but here at the start of 2015 I have set a few goals (or perhaps, just reminders) for myself as a teacher. I thought I would share them with you so you can keep me accountable for them and offer a reminder if I forget! Too often in life we seem to complicate things and over-compensate for a lack of perfection. We teach our students that they do not need to be perfect, but hold ourselves to an impossible standard of perfection. We do not need to have perfectly-organized catalog-worthy classrooms or lesson plans that accomplish 206% of Bloom's words to be great teachers. We do need to take a deep breath and avoid what complications we can. Hint: YOUR STUDENTS! We love our students and they deserve both our best instruction and our most honest devotion. Don't let yourself get too caught up in what others may think of you (or your test scores). Remember how much you care about your little friends and how much you want to change their lives, expand their minds, and bring them true joy through learning. I confess having a day or two of wondering why on earth I chose this job. It can be so hard. Usually it was on days where I was poorly prepared and in a bad mood, thus resulting in poor behavior from my students and little productivity overall. But then I remember those other times where lightbulbs turn on in those bright little eyes, where "ah-ha" moments come out of nowhere, or where children tell you just how grateful they are for you and that you are "the best teacher in the world"! Remember why you really chose this profession, and be grateful that you have the privilege to teach precious children. This anonymous quote seems to pop up in my face whenever I am on Pinterest: "Strive for progress, not perfection." Remember that in the very act of trying to be a better teacher you are in fact being a better teacher. I've only been a teacher for four years and I know I have so much learning and trial and error ahead of me, but I can look back and see the little leaps and little bounds I have made. Just keep going. If you do that you cannot let yourself down. I realized recently that come Monday morning I often say or think, "back to the grind." I have to snap myself out of that and remember that I love being a teacher! Yes, it is stressful and busy and there is always planning to do and copies to make, but the bottom line is that our job is FUN and MEANINGFUL! I'm going to try to smile a bit more at the people I encounter each day, especially my students. I hope to laugh with them and make their days just a bit brighter. In the words of Elder Joseph B. Wirthlin, "Come what may and love it." Thank you for reading, dear friends. I've linked up with Erica Bohrer (she's great!) 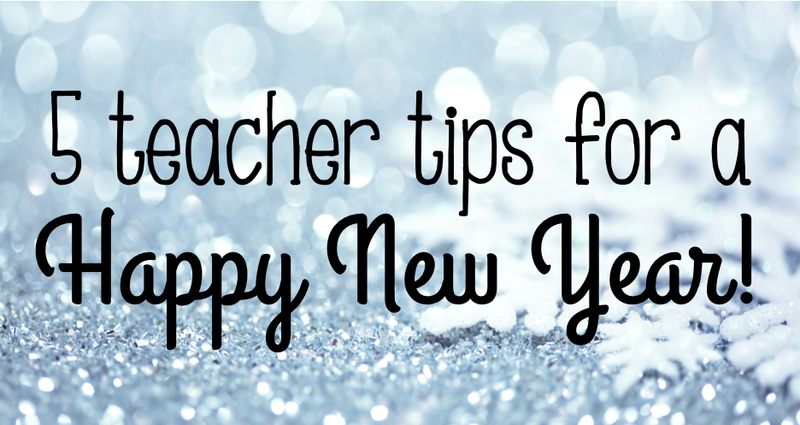 on this post and would encourage you to head over to her blog (here) and read about some other great teacher goals for the new year. I love that it seems to be in our teacher make up to desire improvement and progress! I wish you the best as you embark on whatever goals you have set for yourselves and I wish you a very happy new year!